Because every approach is different and so is every hip. Every surgeon’s philosophy to hip arthroplasty is unique. The Linear is a versatile hip system that incorporates a reduced lateral shoulder, proximal fixation and reduced distal geometry. In combination, these design features provide an inherently stable and ideal implant for multiple surgical approaches to total hip arthroplasty. The proximal lateral shoulder of the Linear hip is reduced, which facilitates the implantation of the Linear Hip is reduced, which facilitates the implantation of the Linear hip and avoids varus implant positioning. 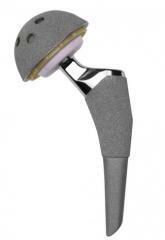 The Linear has a tapered distal stem design that helps to reduce implant stiffness and reduce thigh pain. In addition, this reduced distal geometry facilitates the implantation of the Linear hip from a variety of surgical approaches, including the direct anterior approach. The Linear Hip System features dual offsets with intra-operative trailing for optimal patient fit. An extensive size range and consistent size increments help achieve the best implant fit with the optimal offset. The Linear hip is available with a wide variety of acetabular options designed to suit different patient demands. The FMP™ acetabular system features X-alt™ highly crosslinked polyethylene with multiple head/ liner combinations. For an ultra-low wear ceramic and ceramic option, the Keramos® acetabular cup and liner system is available for the Linear Hip. The Linear Hip incorporates a reduced proximal lateral shoulder, which facilitates the implantation of the Linear hip and avoids varus implant positioning. 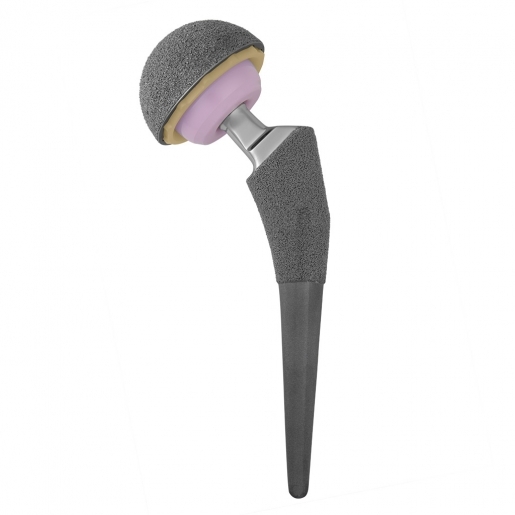 The Linear Hip features a 6° proximal A/P taper in addition to DJO Surgical proprietary porous coating to provide a locking, inherently stable proximal fit. The proximal, tapered wedge shaped design provides a metaphyseal fit with excellent clinical results(1). In addition the 6° proximal taper combined with reduced distal geometry will make for a more ideal fit in femurs with proximal to distal mismatched anatomy. 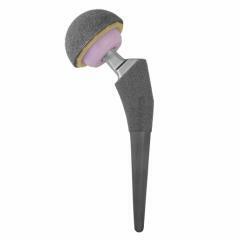 The Linear has a tapered distal stem design that helps reduce implant stiffness which can reduce the incidence of thigh pain. In addition the reduced distal geometry facilitates the implantation of the Linear hip from a variety of surgical approaches, including the direct anterior approach. This Reduced distal geometry will also facilitate proper metaphyseal fit and avoid distal hang up in Dorr Type A femurs(2). Polished reduced neck geometry provides maximum range of motion with minimum wear. The Linear hip system features dual offsets with intra-operative trialing for optimal patient fit. The lateralization option is achieved by keeping the neck angle consistent at 135° and moving directly lateral 8mm. 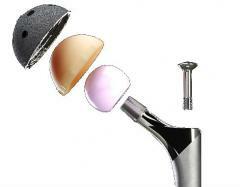 An extensive size range and consistent size increments help achieve the best implant fit which the optimal offset. DJO believes in treating each patient individually, so a comprehensive offering allows us to more closely match each patient’s anatomy. Each stem is available in standard and lateral offset (excluding Sz. 19 which is available Lateral offset only) to provide options that can assist with appropriate soft tissue tension. Furthermore the Linear Hip System is compatible with DJO’s elaborate FMP acetabular portfolio complete with all bearing and head options.